This cute Penthouse opens to a beautiful patio and has a terrace overlooking Calle del Sol in Old San Juan. The entrance to the apartment is especially beautiful, reaching the 3rd floor you will be welcomed by a wonderful, tropical vegetation. The living room is openly designed and receives natural light from Patio and Terrace. The open kitchen is equipped and the dinning area opens to the terrace. The two bedrooms have A/C and can sleep up to 4 persons on one queen and two twin beds. The bathroom has a shower only. There is a washer/dryer available at the apt. 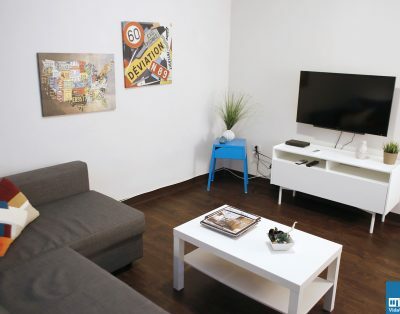 Cable TV & wireless internet are included. The PH is a 3rd floor walk-up.